Numbering in the tens of millions, all-terrain vehicle (ATV) crashes have claimed the lives of more than 11,000 people between 1982 and 2010 and are the subject of pressing public health policy issues ((Consumer Product Safety Commission. (2011). ATV Fatality Database. Washington, DC. ; Government Accountability Office. (2010). All Terrain Vehicles: How They Are Used, Crashes, and Sales of Adult-Sized Vehicles for Children’s Use. Retrieved from http://www.gao.gov/assets/310/302950.pdf)). Unfortunately, individuals under the age of 16 are victims of roughly 25% of ATV-related fatalities and 33% of ATV-related injuries. According to researchers Phrampus, Shultz, and Saladino, ATVs are 3- and 4- wheeled gasoline engine-powered vehicles with large, low-pressure tires and handlebar steering, designed exclusively for off-road use by only a single-rider ((Phrampus, Shultz, and Saladino. (2005).“Injuries Associated with All-Terrain Vehicles: A New Epidemic”. In Clinical Pediatric Emergency Medicine. 6(1): 77-61)). ATVs are most commonly used for either chores/work (hauling, towing, property management) or recreation (pleasure riding, trail riding, sight-seeing). While ATVs serve as a source of enjoyment and a convenient means of travel, public policy concerning ATV safety has become an increasingly prevalent topic. Research on ATV safety is of the utmost importance for the future of thrill-seekers and and common folks alike, as death estimates for the upcoming years are projected to reach as high as 850 fatalities annually ((Consumer Product Safety Commission. (2011). ATV Fatality Database. Washington, DC)). The United States cannot afford to continue ignoring the pressing matter of ATV safety. In the present paper, potential approaches to curbing the number of ATV-related deaths and injuries are explored. Despite their widespread use, ATV crashes are predominantly a rural epidemic. In 1988, due to high incidences of deaths and fatalities caused by ATV crashes, the CPSC (Consumer Product Safety Commission) entered into a 10-year consent decree with all ATV manufacturers and distributors that wanted to sell their product in the United States. The ATV distributors put age restrictions on ATVs and revised safety warnings, so customers understood the potential risks of operating an ATV. In addition, the manufacturers stopped creating 3-wheeled ATVs (which were recognized as particularly dangerous), developed nationwide training and safety education programs, clearly designated ATVs as youth- or adult-sized, made several essential design improvements, and lessened the aggressiveness of their advertising campaigns ((Phrampus, Shultz, and Saladino. (2005).“Injuries Associated with All-Terrain Vehicles: A New Epidemic”. In Clinical Pediatric Emergency Medicine. 6(1): 77-61)). However, once the 10-year consent decree had expired in 1998, only a few participating ATV manufacturers agreed to a new ATV Action Plan. They were compelled to terminate production of 3-wheel ATVs, prohibit sale of adult-sized ATVs for children, and further promote their safety training crusades. Despite such efforts, 1998 marked the beginning of a steep climb in fatality rates, as noted by the chart below. The figure shows the number of fatalities for individuals 16 years of age and older (red line) and 15 years of age and younger (blue line). In fact, according to data compiled by the U.S. CPSC, individuals, most often males, younger than 25 account for more than 50% of all ATV-related fatalities ((Consumer Product Safety Commission. (2011). ATV Fatality Database. Washington, DC.)). The purple lines were calculated by using a linear regression on the CPSC data. 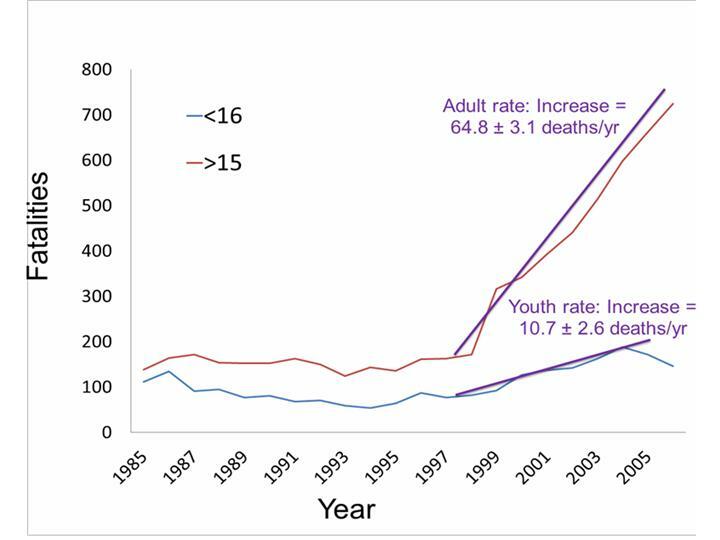 The adult rate (a staggering increase of approximately 65 deaths/year) was over 6 times higher than the youth rate. Experts agree that the number of fatalities per year in the adult and youth demographics will remain at about 720 and 130 respectively. These numbers are particularly shocking, especially when shown in comparison with the rates of 160 and 90 deaths per year for adult and youth demographics respectively during the 10-year hiatus consented in the decree. Overall, the data suggest that the measures implemented during the 10-year consent decree were highly effective. However, this is simply not enough. To keep the ATV-related deaths and injuries to a minimum, laws ought to be instated against ATV manufacturers and distributors that mimic the ideals of the guidelines from the aforementioned 10-year consensus. In addition, responsible legislation and education can help curb the number of ATV-related deaths and injuries. This notion is supported by Helmkamp, Aitken, Graham, and Campbell, who advocate a stricter helmet-use policy. They discovered that ATV-related deaths increased more than three-fold between 1990-1999 and 2000-2007. Helmkamp and his fellow researchers concluded that helmet requirements did indeed help facilitate greater safety because traumatic brain injuries were less frequent in states that were cooperative with the proposed safety measures as opposed to increased injury rates in the states that refused to comply. ((Helmkamp, Aitken, Graham, and Campbell (2012) “State-Specific ATV-Related Fatality Rates: An Update in the New Millennium.” Journal of Rural Health. 27(3):255-262)). ATV awareness and education is also a pivotal facet to any plan with the goal of decreasing ATV-related deaths and injuries. Behavior on an ATV is influenced by the operator’s attitude towards safety, which is in turn determined by said educator’s personal knowledge. The CPSC should work with schools and communities to promote ATV safety education and adults should lead by example. In the table below, it is evident that failure to understand the risks involved in operating an inappropriately sized ATV, carrying passengers, and neglecting to wear a helmet is prevalent. The data speaks for itself. According to the table, most youth under the age of 16 operate an ATV that is improperly assigned and often too large for their size. These adult-sized ATVs are capable of reaching speeds as great as 70 mph and possess an incredible amount of power. In light of these facts, they must be kept out of the hands of children at all costs. In addition, nearly 45% of youth and 20% of adult operators use an ATV with a passenger. This is yet another hazardous practice because the operator must be able to shift his or her weight when turning or driving the ATV on an inclined surface. The ability to carry a passenger is also highly contingent upon the operator’s initial ability and therefore more prone to accident on account of the driver’s possible inexperience. Possibly the most troubling statistic from the table occurs in the use of helmets, or rather the lack thereof. Approximately 75% of youth riders and 84% of adult riders neglect taking even the smallest and most basic of safety measures: that of wearing a helmet. Most have been encouraged to wear a helmet on bicycles, skateboards, and scooters since childhood, a practice further encouraged by the law in many states. Why should such a policy be different for motorcycles or ATVs? These motorized vehicles are even more dangerous due to the greater speeds they can attain. If communities and the CPSC worked together to raise awareness about ATV safety, saddening statistics (such as 850 deaths per year and 150,000 injuries per year from a mere recreational activity) would be virtually nonexistent. In a nutshell, it is imperative that we impose sanctions upon ATV manufacturers and distributors, reinstate laws governing riding behavior, and communities should strive to increase safety awareness if we are to prevent the horrific deaths and injuries caused every year by All-Terrain Vehicle crashes. The chicken or the egg question in a floppy infant syndrome: do motoneurons get sick before sensory neurons?